Appearances of Korean traditional combined beverages.Bongsutang: Korean traditional complex tea prepared with walnut, pine, water, Japgokmisu: Korean traditional complex tea prepared with Jabgokmisu powder and water, Ogwatea: Korean traditional complex tea prepared with quince, chestnut, jujube, ginkgo nut, walnuts and water, Omigalsu: Korean traditional complex tea prepared with omisa, mung bean, Sujunggwa: Korean traditional complex tea prepared with ginger, cinnamon and water. Products of Yanggaeng samples prepared with different kinds of Korean traditional combined beverages.Control: Yanggaeng prepared without Korean traditional combined beverage, BSY: Yanggaeng prepared with Bongsutang, JGY: Yanggaeng prepared with Japgokmisu, OGY: Yanggaeng prepared with Ogwatea, OMY: Yanggaeng prepared with Omigalsu, SJY: Yanggaeng prepared with Sujungwa. AOAC, (2005), Official Methods of Analysis. 18th ed, Association of Official Analytical Chemists, Washington DC. Choi, HE, Ryu, BS, Choi, HM, Kim, JH, Cheong, SM, Lee, NH, Kim, NY, Choi, UK, (2017), Changes in taste compounds and organoleptic preferences of soy sauce with addition of walnut, Korean J Food Nutr, 30(5), p916-922. Folin, O, Denis, W, (1912), On phosphotungastric phosphomolybdic compounds as color reagents, J Biol Chem, 12(2), p239-249. Han, EJ, Kim, JM, (2011), Quality characteristics of Yanggaeng prepared with different amounts of ginger powder, J East Asian Soc Dietary Life, 21(3), p360-366. Han, ES, Rho, SN, (2004), An analysis of consumption and preference of the Korean traditional drinks by women in different age groups, J East Asian Soc Dietary Life, 14(5), p397-406. Lee, HJ, Choi, EY, Chang, PS, Lee, YH, (2004), Classification and category determination of Korean traditional beverages (Ⅰ), Food Sci Industry, 37(4), p42-51. Lee, SH, Lee, YR, Hwang, IG, Woo, KS, Kim, KH, Kim, KJ, Jeong, HS, (2009), Antioxidant activities and quality characteristics of germinated rough rice tea according to roasting temperature, time and leaching condition, Korea J Food Sci Technol, 41(4), p386-391. Lee, YJ, Byun, GI, (2006), A Study on the preference and intake frequence of Korean traditional beverage, Korean J Food Culture, 21(1), p8-16. Oh, SR, Kim, SS, Min, BY, Chung, DH, (1990), Composition of free sugars, free amino acids, non-volatile organic acids and tannins in the extracts of L. chinensis M., A. acutiloba K., S. chinensis B. and A. sessiliflorum S., Korean J Food Food Sci Technol, 22(1), p76-81. Oh, SY, Hong, MH, (2000), Development of a simple food frequency questionnaire using the contribution of specific foods to absolute intake and between-person variation of nutrient consumption for the Korean elderly, Korean J Nutr, 33(4), p429-437. Park, EY, Han, YS, (2007), A survey on the plans to market traditional Korean beverages as take-out products, Korean J Food Nutr, 20(4), p501-508. Park, SJ, Lee, HJ, Kim, WS, Lim, JY, Choi, HM, (2006), Food preference test of the Korean elderly menu development, Korean J Community Nutr, 11(1), p98-107. Seo, JH, Sung, TH, Kim, MR, (2002), Quality characteristics of Sujungkwa, J East Asian Soc Dietary Life, 12(5), p370-378. Shin, MJ, Choi, YJ, (1998), Literature review on the pharmaceutical effect of traditional non-alcoholic beverages in Lim Won Sib Yuk Gi, J East Asian Soc Dietary Life, 8(2), p81-92. Statistics Korea, (2017), 2017 Elderly person statistics, Korea, p15. 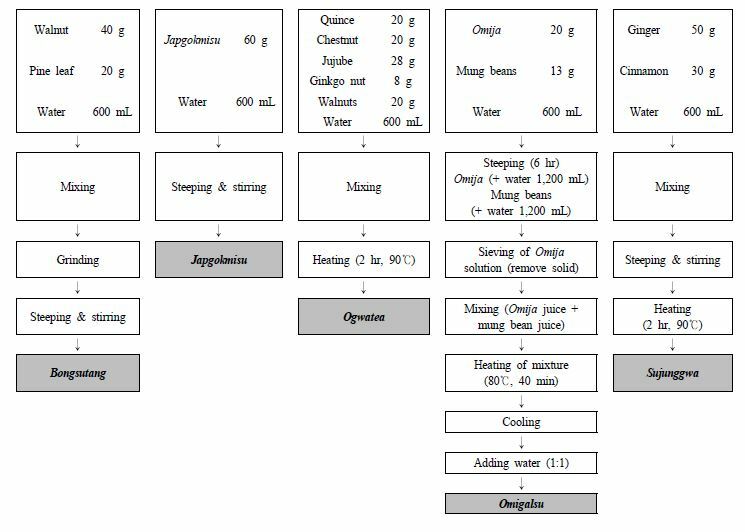 Yoon, KS, Jeong, YJ, Lee, GD, Shin, SR, Ku, JG, (2002), Optimization for hot water extraction of process of Cordyceps militaris using response surface methodology, Korean J Food Preserv, 9(2), p184-188. Yoon, SJ, (1999), Korean Cake, Cookie, Teas, Ji-Gu Publishing Co, p270-317.